The Herald was the new steam paddler, built in Greenock, to operate a packet service between Hayle and Bristol. The wooden vessel has been launched on 30th July 1831 and was owned and operated by the Hayle, St Ives and Bristol Steam Navigation Company (this is name given by the Royal Cornwall Gazette of 1 October 1831, elsewhere is it referred to as the Hayle Steamship Company and the Herald Steam Packet Company) whose shareholders included: Captain Vivian, Herald's skipper; William Bolitho, the Penzance banker and smelter; Henry Harvey, owner of Harvey & Co.'s foundry; and John Harvey Trevithick, son of Richard Trevithick. No messing about here, the decision to start a packet service had been taken as recently as February 1831 in a meeting held at the White Hart in Hayle. The arrival of the Herald was also noted by the St Ives diarist, John Tregerthen Short (JTS) whose diary entry for September 25th reads, “Arrived the Herald, steam-packet, on her first voyage from Bristol.” JTS also noted her second arrival in Hayle on 3rd October and subsequent departure for Bristol on 5th October. After this she evidently becomes a regular sight not worthy of comment until, on January 11th 1832, JTS noted that a schooner, with her fore-top gone, was towed into harbour by The Herald. The Herald's weekly Hayle-Bristol service left room for additional trips and on June 4th 1832 JTS recorded that she had left on an excursion to Penzance and the Scilly Islands. Less pleasantly he also recorded the grounding of the Herald on Hayle Bar on Christmas Eve 1836 but she was able to extricate herself unharmed. The following year, on June 20th 1837 Herald burst her boiler when just about to leave for Bristol from St Ives, scalding the engineer and two of the stokers, and forced to return to Hayle for repairs. 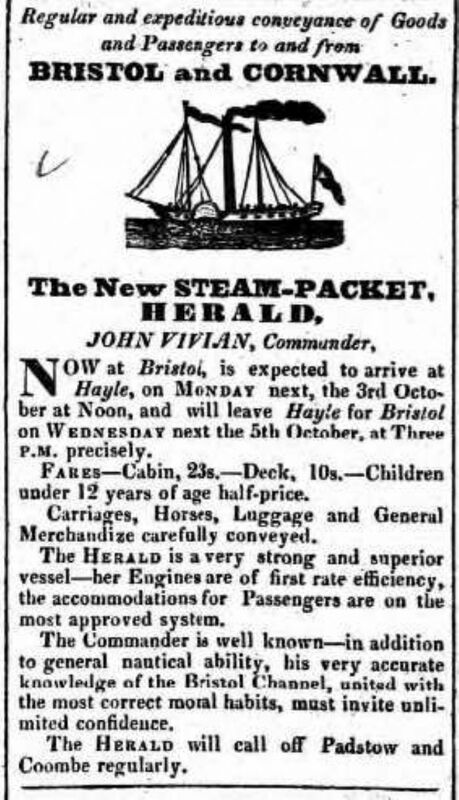 The Herald continued to provide a regular and reliable weekly service between Hayle and Bristol until 1842 when the company acquired a new vessel, the Cornwall, to run the service. Herald evidently continued to make some trips but in 1848 she was put up for sale. For a time, from 1842, the Hayle-Bristol packet steamers operated co-operatively with the new railways with passengers for Cornwall being delivered by train to Bristol and then taking the packet to Cornwall. The availability of the steam packet service must have been a great change for the better for Hayle, St Ives and Penwith. Before steam, shipping could be delayed for weeks making for very uncertain deliveries but the advent of the steam packet is said to have led to a boom in the export of perishables – spring greens in particular – from Hayle to Bristol. Eventually the packet service ran into competition from the railways, with the opening of the Royal Albert Bridge over the Tamar in 1859 finally connecting Cornwall to the markets of big cities. The packet service was no longer the fastest way to the east and with the sale of the Cornubia in 1861 the great days of the packet service were over. Roy Fenton, Cornish Steamships and Owners: the View from England in Troze, Vol 1 No. 3 March 2009. Available here. For more items on maritime transport see here.